Since 1936, Camp Quinebarge has been the best overnight camp in New Hampshire for children seeking fun, friendship, and lifelong memories. With dozens of activities (canoeing, sailing, kayaking, arts & crafts, ceramics, woodshop, nature, horseback riding, sports, archery, climbing wall, ropes course, and more!) to choose from, campers can build their own experience, according to what they love to do or want to try. 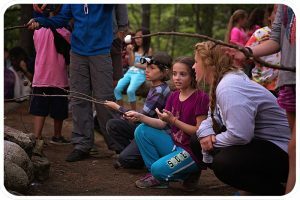 When they aren’t at their chosen activities, campers spend time bonding with their cabin mates over camp outs, Candle Pass, and special trips or programs designed for their age group. At Quinebarge, our campers sleep comfortably in rustic but clean cabins. Each cabin features screened windows, bunk beds, electricity, clotheslines, and a cubby with several shelves for each camper. Girls’ bathrooms are located in each cabin, while boys use our shower house and wash house. Daily cabin cleanup and inspection ensure that campers’ spaces are clean and tidy. And with at least 2 counselors assigned to each cabin, campers get the attention they need. Most campers at Quinebarge are kept so busy with activities, trips, and friends, that they experience little homesickness, or none at all! 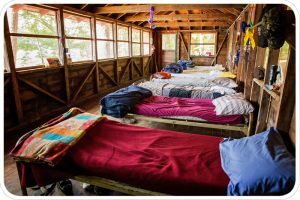 But for those who find themselves missing home, our friendly and responsible staff are specially trained to spot signs of homesickness and help campers work through homesickness and even overcome it. Camp moms Lesley and Cathi are also there to support campers who may need extra support during their stay. 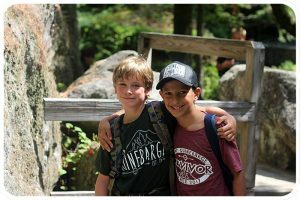 A summer at Quinebarge is all about friendships and fun, but parents and campers alike find that spending time away from home helps build confidence and self-reliance. 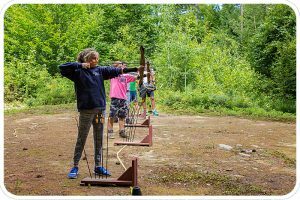 Every new activity or experience is an accomplishment – with each swim level passed, bulls-eye hit, perfect cabin inspection, or trail ridden on horseback, campers develop the skills and independence that will help them succeed as individuals as they grow.